The advanced video coding in high definition (AVCHD for short) is a file format that is based off of the camera technology from Sony and Panasonic. The file format first came around in the year 2006 and since that time it has been used in many high definition camcorders throughout the production standard of Sony and Panasonic. In order to post these types of videos to the web or added these videos it's usually a good idea to first convert them to a more manageable file format that's also more compact. A popular format for many video editors is to convert AVCHD to MP4 format for use. There are many different ways to convert AVCHD into MP4 format. The problem is there are so many choices, and you need to find the option that is best for you. Certain editors are able to convert files much faster as well as offer you the power to edit the MP4 afterwards. There are also some file format converters that will allow you to very briefly change the file format into a number of other format types for easy display on multiple devices. Perhaps one of the best programs that you could use for the conversion process would be to install Wondershare UniConverter (originally Wondershare Video Converter Ultimate). This program installs in just a matter of minutes and it offers a complete video converter service with a full editing suite. The program can be found on the main website and installed in a matter of minutes. The conversion process is much faster than any other web only service as well. You can find more key features about Wondershare UniConverter (originally Wondershare Video Converter Ultimate) as below. Directly convert AVCHD to MOV, VOB, AVI, MKV, and 1000+ other formats. Convert AVCHD videos at 30X faster speed compared with common converters. If you have AVCHD files on your Mac computer, you'd better convert AVCHD files to MP4 for easy sharing or playing on your mobile devices. Take a look at the detailed guide as below. Step 1 Install Wondershare UniConverter (originally Wondershare Video Converter Ultimate) and import the AVCHD file to the program. If you have decided to use Wondershare UniConverter (originally Wondershare Video Converter Ultimate), you can install the program and try the free version. But for more Wondershare features, you need to activate the license code. The license is extremely reasonable given. Installing the program takes just a few minutes and once it is fully activated on your Macintosh computer, you can do your conversion job without any limitation. Then, you can load an AVCHD file by drag and drop to the program. Usually, an AVCHD file will contain several .mts files. After you drag the AVCHD file to the converter, a window will pop up, select the MTS files you want to convert, and then click Add to List to add these files. Step 2 Select the target format MP4 for the AVCHD to MP4 conversion. Choose MP4 from the output section by clicking the drop-down list beside Convert all tasks to: > Video > MP4 > The resolution. By changing the output options, you can optimize the video quality for the web, for HD viewing and more by clicking Create Custom to enter the Settings window. Step 3 Convert AVCHD to MP4 on Mac. After all settings has been done, click the Convert All button and wait just a few minutes as Wondershare UniConverter (originally Wondershare Video Converter Ultimate) does all the work for you. If you want to merge all the MTS videos together, you can enable the Merge All Videos switch before the conversion. Online-converter.com is one of very few places that you can find AVCHD to MP4 conversion. While this online source is an excellent way that you can convert one or just a few files, the process is slow if you have to convert many videos. The online converter for AVCHD has a fairly simple interface, but it can often take a very long time to complete the upload process. Many users have also suggested that sometimes uploads and downloads get interrupted and you have to start the process all over again. 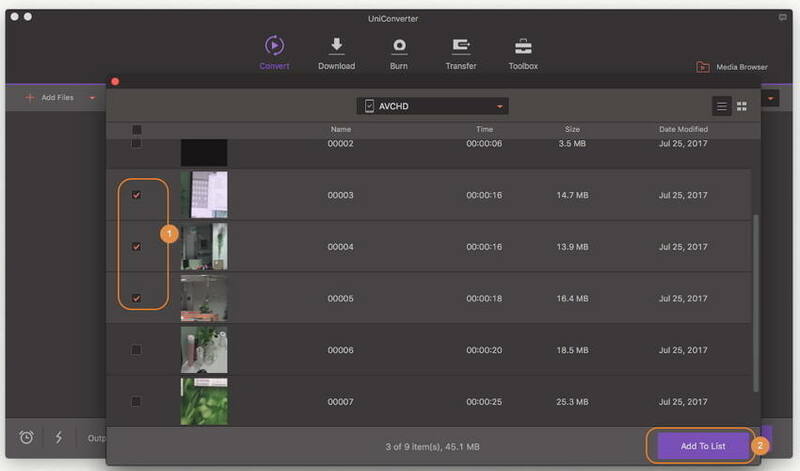 If you need to regularly convert AVCHD to MP4 on Mac, Wondershare UniConverter (originally Wondershare Video Converter Ultimate) is the best video conversion and editing program you can download on Macintosh.